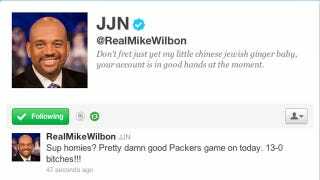 Well, Mike Wilbon's twitter just got interesting. The hacker seems like a generally good-natured sort, but come on, ginger humor? Let's move on from all the ginger stuff. Other than changing the bio and website info, the new Wilbon has tweeted sparingly, mostly to say "Hi" to some randoms and Adam Schefter. The stand alone tweet is the real problem, though. Wilbon giving the Packers some dap? You know something's fishy.